Each measures 4" to 5"
We used this for summer camps while teaching students about ocean and lagoon creatures. Whether the kids were in VPK or junior high school they all loved picking out their animals and making them their own. Be careful of the magnets though they are easily lost. Bring an extra bottle of glue too because some of the backs fall off during shipping. 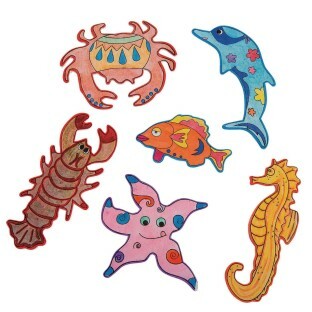 This is an inexpensive craft for children that engages them in sea life. I used them to wrap up a presentation on stormwater protection for our lagoon and ocean for children 4 years old up to 15 years old with great success. If using markers be prepared for the colors to bleed a bit on the wood and slight fading but overall this is a great project! Have glue available just in case for the magnets some of the backing slid and the manufacturer's glue dried.